This week’s Madison+Main Weekly Report is coming to you 2 hours early so I can play hooky this afternoon and watch basketball. Besides, it’s really hard to type inside of a crowded BW3. Last weekend’s whirlwind tour of lower Manhattan and Brooklyn is now just a memory, and sadly the A10 #2 seed VCU lost a heartbreaker to #4 SJU in the Championship, 65-61. Luckily VCUenters the NCAA Tourney as a #5 seed and plays #12 seed SFA tonight at 7:27pm EST #GoRamsGo. My ESPN bracket has me scoring 120 points, with a 67.7% win percentage, since I correctly picked 12 out of the first 16 games. I am currently ranked 797,512th out of 10 million brackets…whew. It was still a highly productive week at Madison+Main, even though everyone caught a touch of March Madness. It was a week full of numbers…and acronyms. Monday (3/17) – On Monday, most schools were closed, but CCPS opened 2 hours late. The hearty souls at M+M “slid” into work on time. Wednesday (3/19) – On Wednesday “I left my heart in San Francisco,” as our universally loved VP of Operations Molly Quarles left “on a jet plane” to celebrate her 29th birthday on the left coast. Did you know that Molly launched SproutLaunch.com, a website that rewards people for doing good deeds, in 2010? Follow Molly on Twitter @SproutLaunch. She only has 14,011 followers and she needs more friends. Over 100 people attended the March Media Mixer at Tobacco Company Wednesday night. Be on the look out for an invite to our April Mixer at Morton’s on 4/23/2014, which is also Administrative Professionals Day. The Bar Bites are on us. Be sure to join our LinkedIn group (669 members and growing!) for details on our monthly Media Mixers. Thursday (3/20) – On Thursday morning, it was my turn to present at Insiders, so we hosted 23 of 24 members at 101 E. Cary. 3 tubs of coffee, 2 dozen donuts and 10 breakfast sandwiches were needed so no one would fall asleep during my presentation. I spent most of the day working on market research for the Chesterfield Chamber. Did you know the Chesterfield Chamber has an introductory membership for only $295? Call Membership Account Executive Carol Taylor at (804) 748-6364 if your business needs a boost. Friday (3/21) – By now, a lot of people have seen our “Banana Campaign.” In fact, after only 2 weeks we’ve reached thousands of people online, and we haven’t even kicked the campaign into high gear. What’s the Banana Campaign, you ask? Madison+Main is conducting a 90content marketing campaign designed to increase awareness, our social media presence, and drive business owners, marketing directors and other potentates to our declaration page. 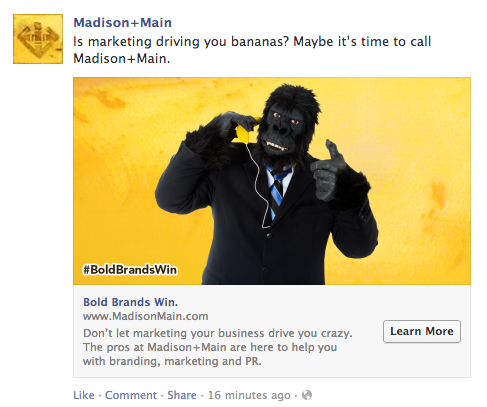 Does marketing your company drive you bananas? If the answer is yes, CLICK HERE.